While having a senior moment means you may have forgotten something, reading Splendid Seniors: Great Lives, Great Deeds is the key to remembering something: the amazing accomplishments made by those over the age of 65. Written by North Hollywood author, playwright and screenwriter Jack Adler, the book recognizes 52 achievers who are recognized for their creativity, political and scientific contributions, personal expression and community involvement. Reading about Alexander Graham Bell, Mary Baker Eddy and Benjamin Disraeli, whose lives were rich with purpose in their later years, is an inspiration to all that it's never to late to pursue a passion. As Frank Lloyd Wright said, "The longer I live, the more beautiful life becomes." Published by Pearlsong Press, the paperback is $18.85 at Amazon.com, bookstores and www.pearlsong.com. 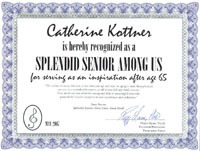 It seems only fitting that Catherine Kottner is being honored as an inspirational senior, since the 79-year-old New York City resident facilitates a weekly women's discussion group on "successful aging." Her advice to others in or approaching their senior years? Stay connected. Keep busy, if that’s always been your way. But also take time, if need be, to figure out who you are. In working with women from many different backgrounds, it probably doesn’t hurt that Kottner speaks six languages. In addition to the Serbo-Croatian she spoke at home as a child and the English she learned in school, she speaks French, Spanish, Italian and Portuguese. She worked for more than three decades as a United Nations executive in New York City, and helped establish the first UN Child Care Center (“a labor of love,” Kottner says). Kottner’s interest in helping others was apparent even in elementary school, when she organized and headed a toy library for children unable to buy their own playthings. She encourages other senior women not to focus on whether they have a man in their lives, how often their children or grandchildren visit, or whether they have children at all. There’s no reason to be lonely or unhappy even if single, widowed or childless, she says. As the “Splendid Senior Among Us” honoree for May 2007, Kottner receives a certificate and an autographed copy of Splendid Seniors: Great Lives, Great Deeds by Jack Adler (original trade paperback published by Pearlsong Press in March 2007). Chicago resident honored as Pearlsong Press's "Splendid Senior Among Us" for April 2007. At the time of life when most people think about retiring, Chicago graphic designer Jan de Goede not only kept working but started four new avocations: drawing, painting, writing poetry, and creating striking illustrated books. By the time Pearlsong Press chose him as its “Splendid Seniors Among Us” honoree for April 2007, the 72-year-old de Goede had 66 paintings and 130 poems to his credit, as well as 20 books—all created since the turn of the millennium. “I’m having fun,” he says. The paintings and line drawings are created with traditional media such as oil paints and pen and ink. But de Goede’s books, including clever full-color parodies of guides to wines, art, and even religion, as well as collections of his line drawings and poems, are created on computer and assembled by hand after being printed on a $79 Canon printer. Thus far only one of de Goede’s books, Chicago Drawings, can be purchased in a public store (the shop at the Chicago Cultural Center). He sells the others on his own; email him at jan@degoede.net if you’re interested. De Goede has had his share of life challenges. It was divorce, for instance, that left room in his life for his new creative pursuits. His childhood idyll in Indonesia ended when the Japanese invaded during World War II; young de Goede then spent three years in Japanese concentration camps on Java. (Afterward, his family moved to Holland, where he studied shipbuilding and lived in Denmark and Sweden before settling in the United States to work as an engineer. When de Goede no longer enjoyed shipbuilding he walked away from a lucrative career and became a graphic design apprentice—“a nobody”—because “I just wanted to do something I enjoyed doing.” He was miserable for a while “because I thought I’d screwed up my life,” but his graphic design work eventually won awards. He’s now glad he made the leap from engineer to graphic designer. 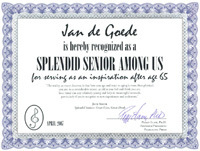 As the “Splendid Senior Among Us” honoree for April 2007, de Goede receives a certificate and an autographed copy of Splendid Seniors: Great Lives, Great Deeds by Jack Adler (original trade paperback published by Pearlsong Press in March 2007). Pearlsong Press is sponsoring the year-long “Splendid Seniors Among Us” program in conjunction with publication of Adler’s book, to honor seniors who are living inspirations. The program honors 12 “Splendid Seniors,” one a month from March 2007 to February 2008. The year-long recognition culminates with publication of a special Splendid Seniors Among Us Adobe PDF ebook that will be available free of charge at the Pearlsong Press website (www.pearlsong.com). For more information about the “Splendid Seniors Among Us” program, see the program's page at the Pearlsong Press website: http://www.pearlsong.com/splendidseniorsamongus.htm. Jack Adler , author of Splendid Seniors: Great Lives, Great Deeds (recently published by Pearlsong Press) is scheduled to guest on The Michael Dresser Show from 3:30-4:00 p.m. CST Monday, April 23. The Michael Dresser Show is heard over the Health Radio Network and the Lifestyle Talk Radio Network, and streamed live over the Internet. To listen live over the Internet, see the info here. Dresser's shows are also archived online at http://www.lifestyletalkradio.com/weekday_hosts/archives/tmds.shtml. Update 4/23/07: Listen to the mp3 recording of Jack's interview at http://www.lifestyletalkradio.com/weekday_hosts/archives/tmds.shtml. He's the second author interviewed in the first hour of the 4/23/07 show. Boynton Beach, FL resident chosen as first honoree in national "Splendid Seniors Among Us" program recognizing people whose post-65 activities can inspire all ages. That didn’t faze Yeager, who went on a few years later to take up skydiving, hang gliding, and whitewater rafting and kayaking—all after turning 80. Yes, the Boynton Beach, FL resident, now 88, has done more than remain active in her senior years—she’s engaged in feats that make many people decades younger quake in their sneakers. And for that, Pearlsong Press has chosen the retired swimming instructor as the first honoree in their national program recognizing “Splendid Seniors Among Us”—people whose activities and accomplishments after age 65 can serve as inspiration to all ages. 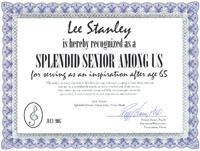 As the first “Splendid Senior Among Us” honoree, for March 2007, Yeager will receive a certificate and an autographed copy of Splendid Seniors: Great Lives, Great Deeds by Jack Adler. The book, published by Pearlsong Press March 15, 2007, recognizes 52 people throughout history who withstood any disabilities of age to continue contributing to society well past their 65th birthdays. Yeager, too, has experienced physical challenges. She is hard of hearing due to eardrum damage suffered decades ago when she was “beaned” by tennis balls twice while playing that sport, Werner says. The blows burst her eardrums and affected her equilibrium as well as her hearing. She gave up tennis as a result, but still hits a pool daily to do six laps, and enjoys going to the beach as well. But the occasional treat also fits into Yeager’s lifestyle. Elam's phone call caught her on the way out the door to get a banana split. The “Splendid Seniors Among Us” program will honor 12 “Splendid Seniors," one a month, from March 2007 to February 2008. The year-long recognition will culminate with publication of a special Splendid Seniors Among Us Adobe PDF ebook that will be available free of charge at the Pearlsong Press website (www.pearlsong.com). Click here for a downloadable PDF version of this press release. For a longer version of the press release, click here. For a full-size PDF of the SSAU certificate for Jane Yeager, click here. For more information about the “Splendid Seniors Among Us” program, see the Pearlsong Press website at www.pearlsong.com. Jack Adler's new book is great! Splendid Seniors should be in every school library, if not on every student's required reading list. It contains a lot of things I'd forgotten, as well as many new and interesting facts about the selected "senior achievers." It makes me want to walk up to people and say "Did you know....?" I found this book to be informative as well as delightful -- a good gift for "juniors" and "seniors." My Dad will be getting a copy for Father's Day! In the forthcoming book Splendid Seniors: Great Lives, Great Deeds author Jack Adler recognizes 52 people throughout history who accomplished great things after age 65. In celebrating the publication of this inspiring book, Pearlsong Press would like to honor the many Splendid Seniors still among us. Nominate as a "Splendid Senior Among Us" someone whose accomplishments after age 65 warrant special recognition and can serve as an inspiration to others. Creativity, productivity, charity, political action, community involvement--any and all areas of life and personal expression can be reason for nomination. Do you know someone who had her first art show at age 70? Published his first book at 66? Founded a charitable organization at 80? Was elected to political office at 72? Started a new career at 65? Or has done--or is doing-- something exciting and rewarding we haven't even dreamed of? Let us know! Nominate a friend, colleague, loved one--even yourself. Pearlsong Press will honor one Splendid Senior Among Us a month for a year, starting in March 2007. The seniors so distinguished will be announced here on the Pearlsong Press blog. They will receive a frameable certificate declaring their "Splendid" status and a free autographed copy of Splendid Seniors: Great Lives, Great Deeds. Their hometown media and mayor's office will also be notified of the honor. 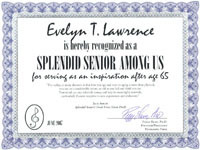 "Splendid Senior Among Us" honorees will be chosen by Pearlsong Press staff from among the nominees for a month. If more than one deserving recipient is nominated, a recipient will be randomly chosen from among the top nominations. In the event of a surplus of deserving nominations in a month, additional nominees may be honored by listing their accomplishments in the Pearlsong Press blog. At the end of the promotional period in March 2008, the 12 "Splendid Seniors Among Us" who have been honored over the past year will be included in a special Adobe PDF ebook that can be downloaded free of charge at the Pearlsong Press website. Plans are for the ebook to contain a short profile as well as a photo of each honoree. In addition, the ebook will be promoted nationally. There is no fee for entering the contest. Nominations can be mailed to Pearlsong Press at P.O. Box 58065, Nashville, TN 37205, emailed to splendidseniors @ pearlsong.com or faxed to 615-352-4222. Please include the full name and birthdate (or birth year) of the person you are nominating, his or her mailing address (for the certificate and copy of Splendid Seniors: Great Lives, Great Deeds if he or she is chosen), and, of course, why you believe he or she is a Splendid Senior. A photograph of the nominee can also be sent by mail or email, for possible posting online or use in Splendid Seniors publicity as well as the ebook. Submission of a photograph will be understood as permission for Pearlsong Press to publish the photograph. Nominations must also include the nominator's name and contact information (address, phone number, email address if applicable). The nominee's and nominator's contact information will remain private unless you and/or the nominee give permission for it to be included in press releases for media contact. Splendid Seniors: Great Lives, Great Deeds by Jack Adler will be published by Pearlsong Press in March 2007. A collection of 52 biographical sketches and inspiring and amusing quotations of people who achieved great things after age 65, Splendid Seniors reminds us that creativity, passion & influence can not only flower in later years, but bear delicious fruit. Read more about the book and author at the Pearlsong Press website. And stay tuned to the Pearlsong Letter blog for information on how you can nominate a friend, loved one, or yourself as a Splendid Senior.